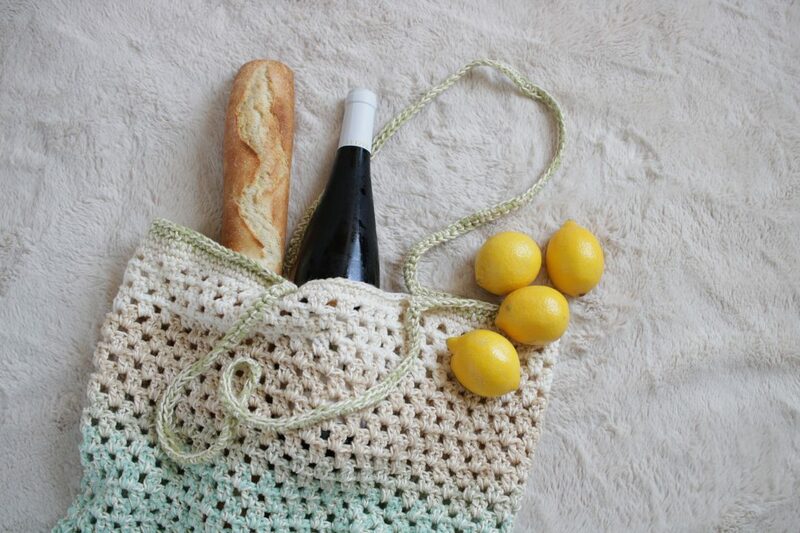 Familiar stitches are constructed in a new way to build the perfect market bag, the Fresh Market Tote! Three cheers to my friends at JOANN Stores for inspiring this fun summer project. I’m a huge fan of farmer’s markets and love using reusable bags. So, why not make one? 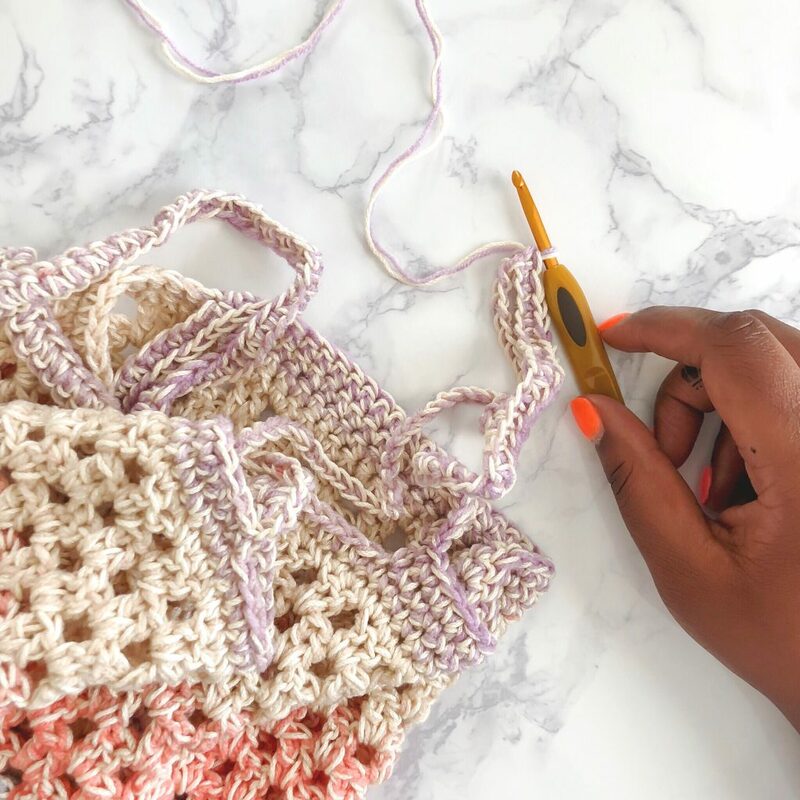 I’m excited to share this FREE pattern as well as the accompanying video tutorial for the Fresh Market Tote. Find a printer friendly, PDF version of the Fresh Market Tote Bag in my Ravelry shop and on TLYarnCrafts.com. PDF version includes single page instructions and easy-to-read recipe style pattern. 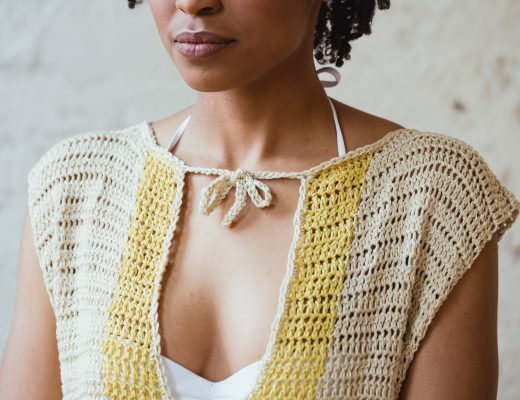 Favorite this pattern on Ravelry – CLICK HERE! It just wouldn’t be summer in the Midwest without an abundance of farmer’s markets. I like to spend my Saturday mornings strolling the aisles of fresh herbs, fruits, and vegetables from local farmers. I also tend to go overboard on the flavored honey and hand-poured candles that the vendors bring. By the end of my trip, my bags are overflowing with goodies to take home. The Fresh Market Tote was inspired by those Saturday morning visits, when I always bring my own bags to go shopping. 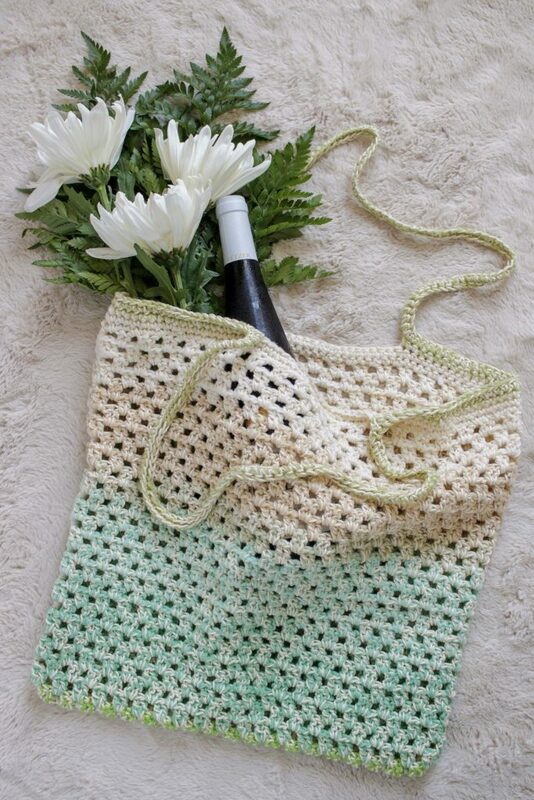 I wanted to design a sturdy crochet market bag that was also pretty and easy to care for. 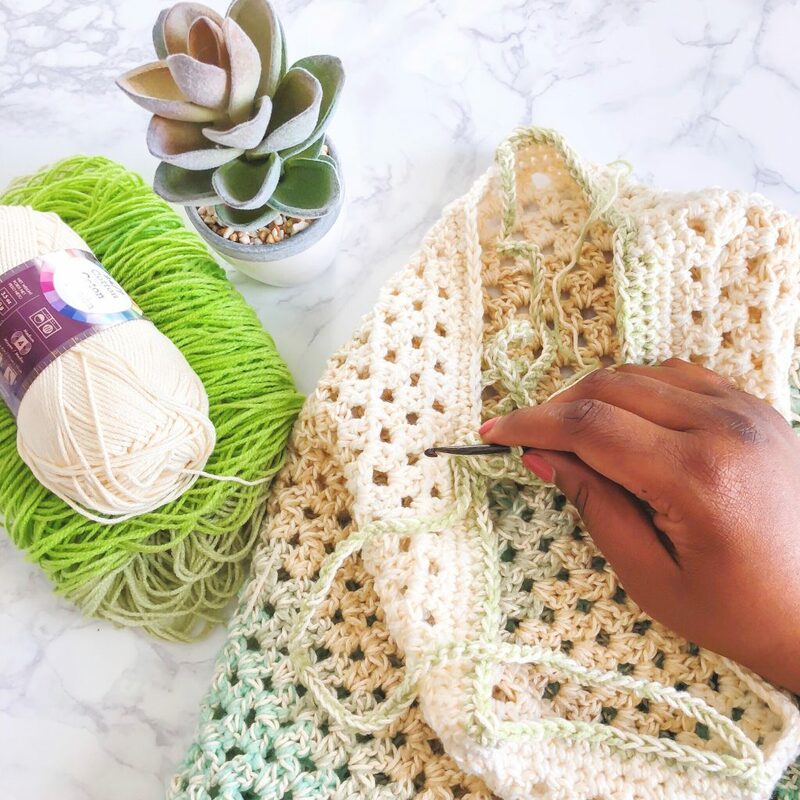 My friends at JOANN Stores were kind enough to provide yarn support for this project, and I landed on using two Lion Brand products: Cupcake and 24/7 Cotton. The yarns are held together throughout the project to take advantage of the color changes in Cupcake and the strength of 24/7 Cotton. 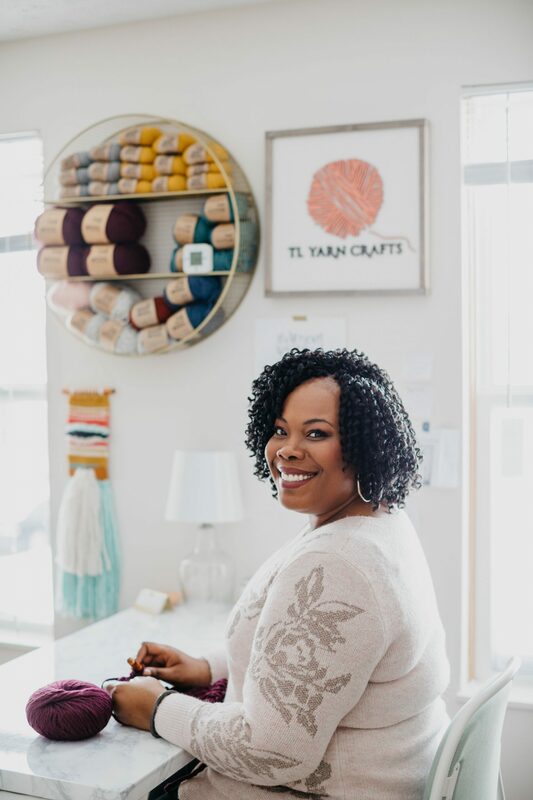 The Fresh Market Tote is simply constructed using a combination of slip stitches chain stitches, single crochet, and double crochet. 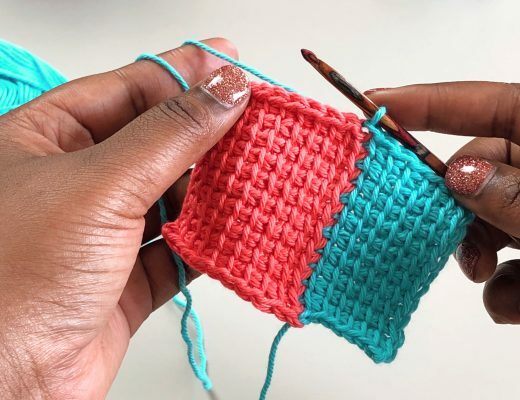 Experienced makers may recognize that the body of the bag is made with a modified granny stitch. Instead of placing 3 double crochet in one space, I went with two. This adds a lightness to the bag while also reinforcing its strength. The entire bag is made flat and seamed along the sides. Then straps are added. To keep the straps from stretching, I reinforced them with some additional single crochet stitches. The overall effect is cute yet practical, and perfect for gifting. -1 ball of Lion Brand Cupcake yarn. Samples made with colors Sand Castle and Gelato. -3 balls of Lion Brand 24/7 Cotton yarn. Samples made with the color Ecru. NOTE: Beginning ch 3 counts as a dc and beginning ch 4 counts as dc + ch 1. STEP 1: Holding one strand of each yarn tog, ch 122. Dc in 4th ch from hook. Dc in the next ch, (ch 1, sk 1 ch, dc in the next 2 chs) across to last 3 chs. Ch 1, sk 1 ch, dc in the last ch. STEP 2: Turn. Ch 3 (counts as dc here and throughout). 2 dc in the first ch 1 sp. Ch 1, (2 dc in the next ch 1 sp, ch 1) across to tch. 3 dc in tch sp. STEP 3: Turn. Ch 4 (counts as dc + ch 1 here and throughout). (2dc in next ch 1 sp, ch 1) across to last 3 sts. Dc in the space between the dc and tch. STEP 4: Rep Steps 2 and 3, 12 more times. You will have 27 total rows. STEP 5: Ch 1. Rotate panel clockwise and bring short sides together to begin a sc seam. Sc 2 sts in the ends of the first row, sc 1 st in the ends of the next row. Rep this pattern along short edge. Ch 1. Rotate panel clockwise to begin a sc seam along the bottom. Sc evenly across bottom edge. Cut yarn. STEP 7: Ch 1. Sc in the same st as join and each sc around. Join with a sl st in the first sc of round. STEP 8: Ch 1. Sc in the same st as join and the next 18 sc. Ch 85, sk 21 sts, sc 38, ch 85, sk 21 sts, sc 19. Join with a sl st in the first sc of round. STEP 9: Ch 1. Sc in the same st as join. Sc to chs. Sc in each ch. Sc to chs. Sc in each ch. Sc in rem sts. Join with a sl st in the first sc of round. Cut yarn and weave in all rem ends. 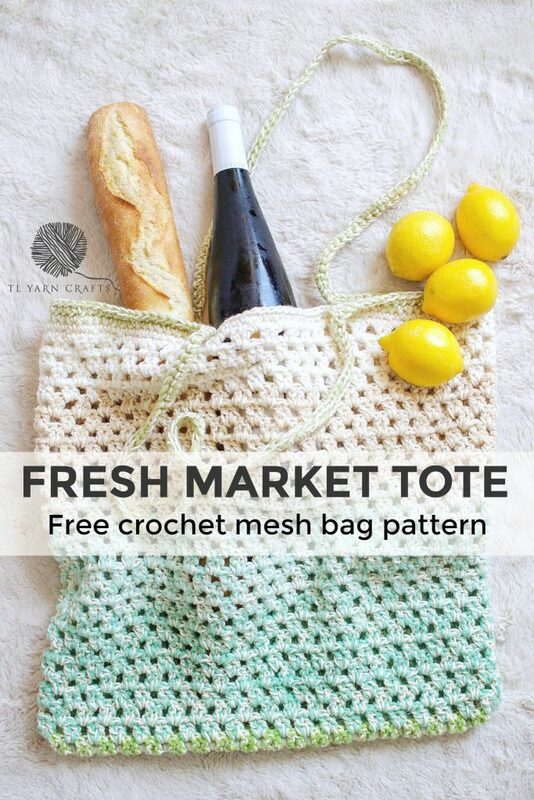 Purchase the printable PDF Fresh Market Tote pattern HERE! I hope you love the Fresh Market Tote! I can’t wait to see all of your projects! Share then with me on Instagram and Facebook using the hashtag #TLYCMakers for a chance to be featured on my feed. 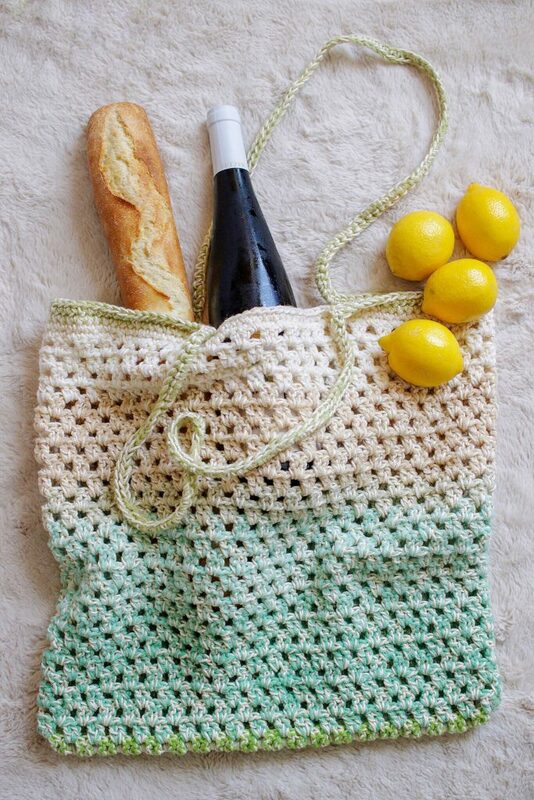 Comment below and let me know what yarn and colors you’ll use for your Fresh Market Tote! Could you use single strand Caron cake 80% acrylic and receive same results or at least similar? Hi Raquel! Thanks for your question. If you were planning to use a Caron Cake instead, I’d still hold it double with a strand of cotton. The cotton adds integrity and prevents the bag from stretching too much. If you still want to use the Caron Cake along, I’d go way down on the hook size, maybe to a 3.75mm. I have to say I love your blogs and your videos. 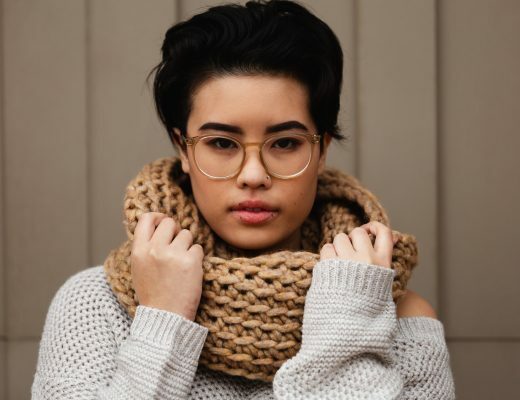 I picked up crocheting and knitting again after taking a decade or so off to live life (have kids, get divorced move across the country, have a couple love affairs, start new jobs, etc.) Jumped on youtube to pick it back up and I’m In Love and cant fathum why I ever stopped. Anyway I recently had to buy all new undergarments because over the last couple months I gained about 20lbs or so, on purpose and I’m loving it 🙂 Was thinking after purchasing all these new items…I could use a bag to put them in so that when its time to wash them I don’t have to sort through all the other clothes, I can just grab the bag dump everything in the wash and toss the bag in there too. THIS bag or a variation of it will be perfect. So I said all that to say Thank You for helping spark in me something that I have fallen in love with all over again. Keep up the great work! !